Over the summer Jack was away for the weekend so we decided to treat Ava to a day out in New York, hitting up all the sights her brother would have rolled his eyes at in boyish disgust. At the top of her list was the American Girl store in Midtown. We got an early start with her doll Saige in tow and a long list of what she wanted to see and do at the store. 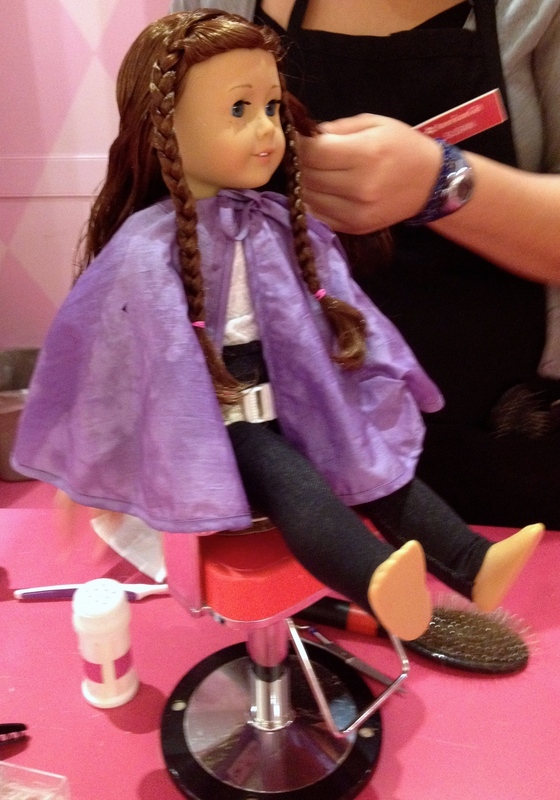 If you've never visited an American Girl store, you are in for quite a treat. You can do everything from have a meal with your doll (make reservations very far in advance for this) to getting a picture taken in their professional studio. Ava chose to have Saige's hair done in the doll hair salon. There are several different hair styles to choose from and once you have made your decision, you are given an appointment time (usually a 30-60 minute wait). Upon your return, the doll is put into her chair and the stylists work their magic. After selecting a few new outfits and a pair of glasses for Saige, we walked over to the Plaza. If you are celebrating a special occasion, I would make a reservation to have afternoon tea in the Palm Court. We opted to head downstairs and eat at the Food Hall (after a quick photo op with Eloise). In the Food Hall, you can find everything from Luke's Lobster to No. 7 Sub to Todd English. On this day we chose Tartinery. Their menu is mostly soups, salads and tartines, which are basically open-faced sandwiches made with an array of toppings. Their tartines are big enough to easily feed two kids and there are enough choices that they should be able to find one they can agree on. For dessert you can grab a cupcake at Billy's Bakery, a piece of chocolate from La Maison du Chocolat or (our personal favorite) a macaron at Francois Payard. Then it is over to the Eloise store located on the side of the food hall. The store is great with a mix of Eloise-themed toys and books along with clothing from Olive Juice, rain slickers from Hatley, and backpacks and lunchboxes from Beatrix New York. You can also have a meal here in the adjacent party room. If you are still up for more, you could head across the street to Central Park or over to FAO Schwarz for some more shopping. As for us, we were done and headed home with a very happy little girl in the backseat who was already planning what we would do the next time Jack was away.